PHA manufactures and ships approximately 1,000 tonnes of floor sweeps & absorbents per year from its plant in Woodburn NSW to customers all over Australia. Typical size bags are 10kg. Standard pallet configurations are 700kg containing 70 x 10kg bags. 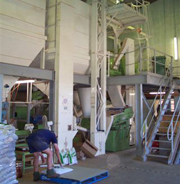 Product is shipped by truckload (22 or 34 tonnes per load). Smaller or larger shipments are available on request. We supply the following customers with custom made & bagged floor sweeps.